Our paper analyses the long-term relationship between regional inequality and economic development. The literature points that, from a spatial perspective, the convergence process may display a non-linear evolution. In this respect, Williamson (1965) suggested that throughout the economic development process regional inequality exhibited an inverted U-shaped pattern. He observed that in the early stages of modern economic growth industrial activity was concentrated in specific locations while the rest of the regions remained largely agricultural. This in turn increased per-capita income inequality across regions. However, over the long term these disparities eventually disappeared. For a long time the Williamson hypothesis had no sound theoretical backing. However, Barrios and Strobl (2009), following the Lucas (2000) growth model, provided a theoretical foundation for the Williamson hypothesis in line with classic theorizing contributions on regional economic growth. A small but slowly growing body of empirical works have tested the existence of a Kuznets curve in spatial inequalities. Importantly, due to limitations in the availability of historical data, studies have focused on recent decades. Barrios and Strobl (2009) and Lessmann (2014) confirm the existence of an inverted U-shaped pattern, and the latter also shows that spatial inequalities increase again at high levels of economic development. 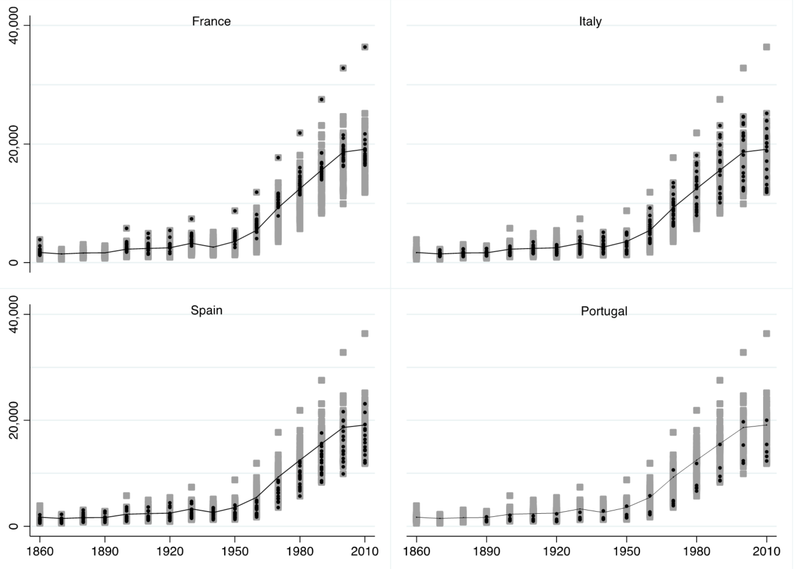 However, these studies examine the evolution and causes of regional inequality since 1975-80. And three decades can hardly capture deep structural changes. A more suitable way of approaching the topic would therefore be to study the evolution of regional inequality during the whole process of economic development, i.e. examining the long-term dynamics of countries since the early stages of modern economic growth. This would make it possible to account for the transition from agrarian to industrial and service-based economies. Industrialization processes in Europe began during the nineteenth century when the novel technologies of the first and second industrial revolutions spread across the continent. As economic historians have already documented, the processes of industrialization were characterized by their regional nature (Pollard, 1981). Technological shocks, industrialization and structural change did not arrive in all regions at the same time and therefore not all regions became richer at the same time, and this led to an initial upswing in regional disparities, as suggested by Williamson. Recent developments in economic history make it possible to study the long-term evolution of regional income inequality. 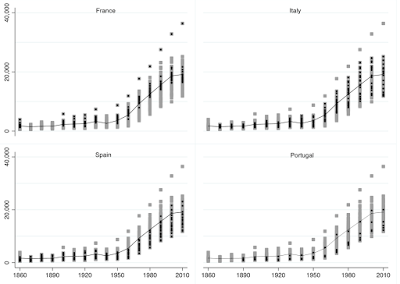 In this paper we have collected figures for regional population and regional gross domestic product (GDP) for France, Italy, Portugal and Spain at the NUTS2 level, on a decadal basis between 1860 and 2010. The next figure shows the regional per-capita GDP in each country (dark-coloured dots) compared to the average per-capita GDP for South-West Europe as a whole (solid line) for 1860-2010. The grey bars represent all the regions of the four countries taken as a whole. As can be seen, the graphs provide a more complex picture than the country-specific histories that have already been extensively documented in the literature. Indeed there are big differences within countries, and regions can be found in all of them with levels of income both above and below the average for South-West Europe. In addition, relevant changes to the economic geography of South-West Europe occurred during the period of study. To explore the main geographical patterns in the spatial distribution of income, the next figure shows maps of regional per-capita GDP. The regions are grouped in quintiles for 1900, 1950, 1980 and 2010. Black indicates “very rich”, while the lightest grey indicates “very poor”. By 1950, most of the southern regions of Italy and the vast majority of Spanish and Portuguese regions were at the bottom of the income distribution. In both Spain and Italy there had emerged a clear north-south divide pattern, while in Portugal only Lisbon had respectable income levels. Furthermore, the rich regions were clustered in a gradient centred on the north of France around Paris (Île-de-France) and northern Italy. In short, it seems that a core-periphery pattern already existed in 1950. 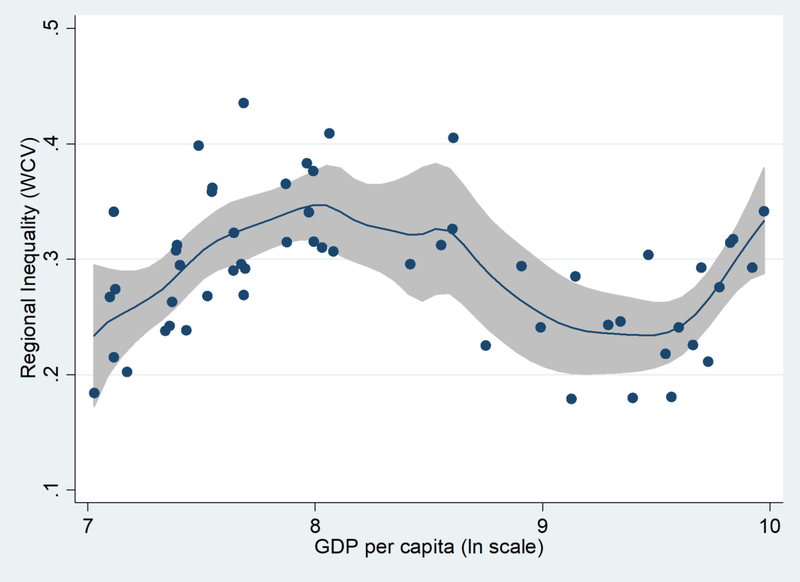 Next, we measure regional inequality using the population-weighted coefficient of variation. This indicator shows that there seems to be a general trend towards increasing regional inequalities in the early stages of modern economic growth. While convergence does at some point begin, the timing of the reversal from divergence to convergence varies across countries. By 1980 the inverted U seems to be complete in all four countries; over the last three decades regional catching-up has come to an end or even reversed. In order to further investigate these issues, we conduct a sound econometric analysis to empirically test the relationship between economic development and regional inequality. In so doing, we combine parametric and semiparametric techniques. The next graph summarizes our findings. It shows a clear bell-shaped curve, supporting the idea of an inverted U-shaped relationship between spatial inequality (y-axis) and development (x-axis) over time. It also shows increasing inequalities at high levels of economic development at the upper tail of the GDP distribution. In order to further explore this issue, we next examine the potential mechanism behind the inverted-U curve suggested by Kuznets (1955) and Williamson (1965). These authors established that structural change is a major driver of regional inequalities, with the transition from agrarian to industrial economies being responsible for the evolution of these inequalities. A bell-shaped curve is again obtained. Thus, this result suggests that structural change (the shift from agriculture to industry) has caused the inverted-U pattern observed in the data. Finally, we carry out several robustness checks. On the one hand, we consider alternative measures of inequality instead of the weighted coefficient of variation. On the other, to avoid any possible bias due to the predominance of the capital cities, we calculate regional inequality excluding the region in which the country’s capital is located. In all cases, the results show a clear bell-shaped curve. All in all, three main results are obtained. First, the study confirms that, over the course of the historical process of economic development, regional income inequality has followed a U-shaped evolution. Interestingly, in the more recent stages of development the trend is on the rise again. This result is robust not only to the inclusion of confounding factors that may have an effect on regional inequality (the size of regions, trade openness, agglomeration economies and public policies), but also to the use of alternative measures of inequality. Second, our results also show that economic growth has been more intense in the most populated regions, which, in the context of the four South-West European countries studied, correspond to those in which the capital cities are located. The dynamism of these ‘capital’ regions could therefore explain the recent upsurge in regional inequalities. Third, in line with Kuznets (1955) and Williamson (1965), we identify structural change as being a significant transmission mechanism of the inverted-U relationship that we have found between economic development and regional inequality in the long term. Barrios, S., Strobl, E., 2009. The dynamics of regional inequalities. Regional Science and Urban Economics 39 (5), 575-591. Kuznets, S., 1955. Economic growth and income inequality. American Economic Review 45 (1), 1-28. Lessmann, C., 2014. Spatial inequality and development. Is there an inverted-U relationship. Journal of Development Economics 106, 35-51. Lucas, R.E., 2000. Some macroeconomics for the 21st Century. Journal of Economic Perspectives 14 (1), 159-168. Pollard, S., 1981. Peaceful conquest: the industrialization of Europe, 1760-1970 (Oxford: Oxford University Press). Williamson, J.G., 1965. Regional inequality and the process of national development: a description of the patterns. Economic Development and Cultural Change 13 (4), 1-84.